Sacrament, since we were committed into close Prison, which we know to be Lies. that their Mother had made them so, who has been confined here this nine Weeks. lb. s. d. lb. s d.
The whole amounting unto Five hundred seventy eight poundes and twelve shillings. according as the law directs & for which this shall be your Warrant. When first married, the Carriers had lived in Billerica where Martha's sister, Mary (Allen) Toothaker, and her family lived. About 1686, the Carrier family moved to Andover. In the fall of 1690, the smallpox epidemic, which had begun in Boston in late 1689, reached Andover, killing over a dozen people there. Included in this number were seven members of the Allen family. The Carriers were accused of bringing smallpox to Andover and were banned from entering public places. In May of 1692 during the Salem Village conspiracy, the Carriers were imprisoned; Martha Carrier was committed to the chains of Salem Prison. On June 28th 1692, a summons for witnesses against Martha (Allen) Carrier included Samuel Preston, Jr. Phoebe Chandler, and John Rogers. Phoebe Chandler, age 11, testified: claiming "I was struck deaf, and could hear no prayer, nor singing, till the last two or three words of the singing" during a Sabbath Day meeting. On August 11, 1692, Thomas Carrier Jr.,age 10, Sarah Carrier, age 7, were tricked by Magistrate Hathorne(gg grandfather of the author Nathaniel Hawthorne) into naming their mother as a witch. The abuse of Martha Carrier's four children was a tactic used by the court to induce her to confess; she never did. 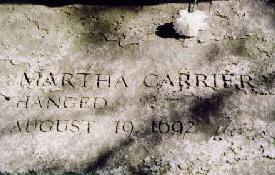 On August 19th,1692, Martha Carrier was hanged at Salem. Andrew Elliot-already mentioned, Henry Herrick Sr.
See Phoebe Chandler, and John Dane references to Martha Carrier and Thomas Carrier with Judge Hathorne. of the Allen family. The Carriers were accused of bringing smallpox to andover and were banned from entering public places. On May 18th 1692, the conspiracy of accusers in Salem Village filed a complaint against Dr. Roger Toothaker. They charged him with afflicting, among others, Elizabeth Hubbard, servant of his rival, Dr. William Griggs of Salem Village. Dr.
Andover. On May 31st they were arrested and imprisoned in Salem. On July 23d 1692, Mary's daughter Martha (Toothaker) Emerson was accused and arrested. Mary Toothaker now a widow made a confession before the Magistrates at Salem. Mary confessed to having made a covenant with the Devil in the past May for protection from the Indians. About a week later, on August 1st 1692, the Indians attacked Billerica and at least six persons were slain. The Indians returned a few days later and burned down the deserted Toothaker farm. On August 5th 1692, Mary's sister Martha (Allen) Carrier was condemned by the Court of Oyer and Terminer, and on August 10th she was hanged at Salem. On February 1st 1693, at the Superior Court of Judicature at Charlestown for Middlesex County, Mary Toothaker was found not guilty in a trial by jury. Her daughter Margaret was also released. In 1695 the Indians raided Billerica. They killed widow Mary (Allen) Toothaker and carried off Margaret,now 12,who was never heard of again. Crest: A lily springing from a crown.